Details: A collection of 125 delicious whole-foods recipes showcasing 16 antioxidant-rich power foods, developed by wellness authority Rebecca Katz to combat and prevent chronic diseases. Despite our anti-aging obsession and numerous medical advances, life spans are actually shortening because of poor lifestyle decisions. But it doesn't have to be so. Food-as-medicine pioneer Rebecca Katz highlights the top sixteen foods proven to fight the most common chronic conditions. 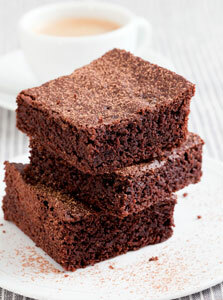 Katz draws on the latest scientific research to explain how super foods such as asparagus, basil, coffee, dark chocolate, kale, olive oil, sweet potatoes, and wild salmon can build immunity, lower cholesterol, enhance memory, strengthen the heart, and reduce your chances of developing diabetes and other diseases. This practical, flavor-packed guide presents the most effective—and delicious—ways to use food to improve the performance of every system in the body. Katz explains the health advantages of each main ingredient, and includes menu plans to address specific symptoms and detailed nutritional information for each recipe. Based on the most up-to-date nutritional research, The Longevity Kitchen helps you feed your family well and live a long and vibrant life. Preheat the oven to 350°F. Line an 8-inch square baking pan (see note) with two pieces of foil long enough to overlap on all four sides. Lightly oil the foil. You can learn a lot sitting on the tailgate of a pickup truck. That’s where my buddy Chris, from Zuckerman’s Farm, used to sit me down and teach me about all things asparagus. Chris worked hard--awfully hard--as a farmer. He was true salt of the earth, and as generous as they come. Normally, there’s an invisible line: farmers behind their wares and buyers on the other side, but Chris always insisted I “step into his parlor.” Both of us were always so excited when the first asparagus of the season showed up. He’d put aside a bunch for me, and then we’d both hop up on that tailgate and talk—about recipes, how amazingly nutritious asparagus is, and, a lot of the time, about life and family. Chris passed away not long ago, and I felt the best way I could honor him was to create a recipe featuring his favorite veggie. I think he would have enjoyed this, and I hope you will too. ut the arugula in a large bowl. Drizzle with half of the dressing and toss until evenly coated. 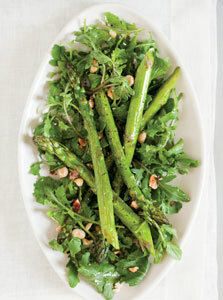 Mound the arugula on individual plates or a platter and arrange the asparagus on top. Drizzle with the remaining dressing and sprinkle the hazelnuts on top.